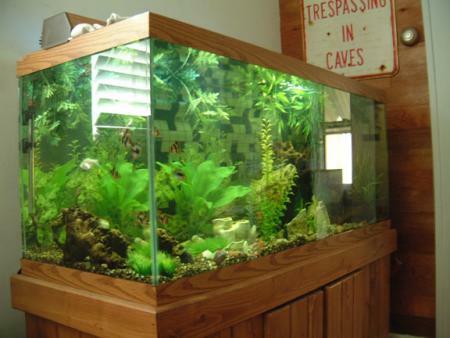 One day my girlfriend Jacque set up a 10 gallon fish tank in her room. I was immediately inspired and decided that it was time I got a tank, since I’d wanted one since I was a kid. I knew nothing about fishkeeping, but we set off for the obscure pet store that Jacque knew of way up in Forest Lake (about 45 minutes north of the Twin Cities). I had an idea I’d get a 20 or 30 gallon tank – but when we got to the store I quickly let the guy upsell me to a huge 75 gallon tank with a natural pine stand. Unlike me, I did not do any comparison shopping or seek out a used one, even though it was an expensive purchase – nor did I even think about the cost, really – and I had only a vague idea where it might fit into my small house. More problematically, I also didn’t think about how the hell I was going to get the tank home – when the employees brought it out back, it was immediately obvious that it would never, ever fit into either the backseat or the trunk of my old Volvo. However, I didn’t have to worry for more than a moment, because our friends Matt & Mandy coincidentally showed up in his cargo van just in time – at the pet store an hour away from their house. So the fishtank came home effortlessly (and it fit perfectly in the living room when we arrived). Yay!! I love this site already. Max, the synchronicity generator! PS how can we follow this? Don’t see a spot to do that. I remember! And do you remember that Matt & I had run into you and Jacque at the pet store near your house (on Chicago Ithink? )?